Hey asha :) Turkish sounds lovely! I have aroma on my favourates, I am new to blogging so can you please tell me what you mean by an event? Hey Jeena, You can make rasmalai with ricotta cheese. Blend 1cup cheese with 2tbsp sugar and mix well. pour the mix in muffin pans and bake for about 20-30 min just check if the cheese is turned in to light pink color. then you can boil Half n half or evaporated milk with some sugar and saffron. let both of them cool a lil and then you can add the cheese balls to the milk. that it. I have to yet try. 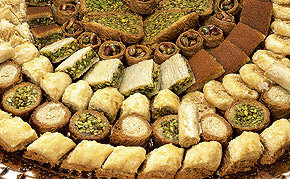 Btw the Lebanese sweets look so good. I love both Lebanese and Turkish vegetarian dishes. The flavours are simply marvelous. Nice blog there. Thanks for visiting mine. I have no idea what Middle East Cuisine is :(. Had Baklava, Hummus and Falafel a few times. I love Lebanese and Middle Eastern foods, but unfortunately, I can no longer eat the lovely desserts and grain-based foods because they send my blood sugar sky high. But the meat dishes are so good too, especially lamb and goat. Do you plan to post any recipes for those kinds of things? Hi Anna, Yes when I get some recipes together I will be posting them, I like lamb too but we don't really eat a lot of meat and the recipes I put on are the ones I am cooking frequent. So I will mainly put recipes on where you can choose to make with either meat or a hearty veg :) I must admit though I was tempted to get some minced lamb the other day for a lebanese recipe!